NEW YORK, NY--(Marketwired - April 12, 2016) - Virtuoso® , the international network of luxury travel agencies, is unveiling the 12 emerging travel technology companies participating in its innovative Incubator program for 2016. As the industry's first formal program to foster new technology, Virtuoso Incubator seeks out, refines, then introduces tools to enhance service levels, provide efficiencies and ultimately help its members maintain their competitive edge. More than 100 companies within the rapidly growing $5.2 billion travel technology space applied this year -- twice the number of 2015 -- causing Virtuoso to be highly selective in choosing which tech initiatives to nurture. "Virtuoso Incubator is focused on finding solutions that enhance advisor productivity and client service because the primary goal is to ensure our members remain the most competitive in the market," said David Kolner, senior vice president, Global Member Partnerships at Virtuoso. "And when you consider that $190 million was funded into B2B technology startups in 2015 alone, our role becomes one of curation and cultivation. No single tech advancement can meet the needs of 11,400 advisors in 37 countries, and this program allows Virtuoso to present our members with options so that they can choose the best solutions for their unique businesses." AlannaTech: A database management system that helps automate agency and advisor communication and marketing campaigns. This multilingual platform also enhances client knowledge to increase sales and trip personalization. CheckMate: From before check-in through departure, CheckMate's tools enable on-demand hospitality to have a two-way conversation between advisors and travelers through any means of communication -- text, email or phone. Engage: An integrated chat and video communication tool that helps advisors sell immediately anywhere online on any device, and makes clients accessible to advisors anytime with one click. FITeXplorer: A bilingual English-Spanish productivity tool that creates complex itineraries and allows for easy changes to bookings within itineraries in real time. 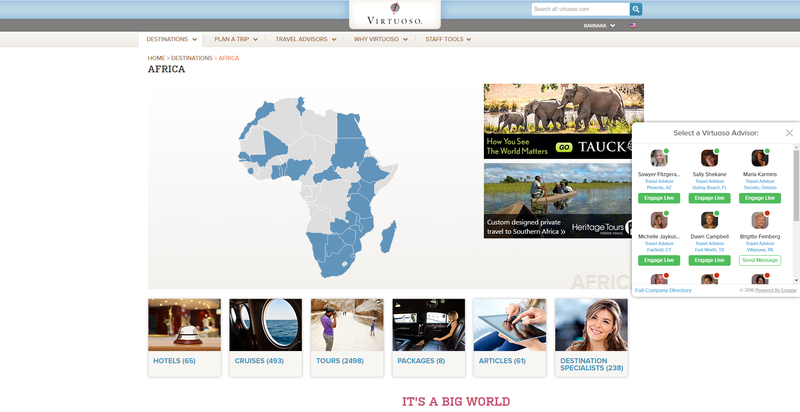 It provides seamless custom, global, and multi-destination itineraries in minutes. 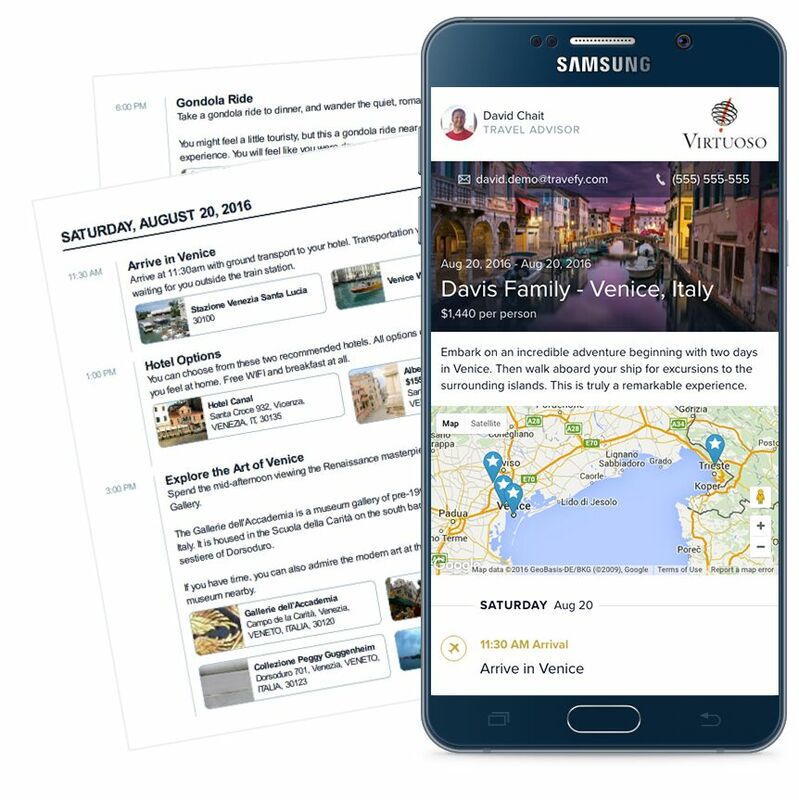 The Quest: An itinerary management tool that offers extensive supplier libraries and real-time updates so advisors can create and share itineraries. It syncs with ClientBase continuously, pushes content in PDFs and a smartphone app, reduces errors, and saves time. Tandem Cruise Booking Engine: A B2B cruise booking tool that efficiently finds, compares, quotes, and books cruises from a single web-based system. Virtuoso is testing a customized version of this which includes unique features and content designed for its member agencies. Travefy: A collaboration platform for group travel, including money collection and custom itineraries. Advisors can invite travelers to a shared platform for discussions, polling, and collaborative itinerary management. TripBAM: The only global hotel rate assurance solution that works with any GDS, can apply a cluster of hotels, and shop for commission conversion opportunities. It helps lower hotel costs, increase commissions and improve compliance to negotiated programs. TripChamp: A booking tool that allows advisors to see fares from their GDS as well as fares from other sources not available on the GDS, and access the marketplace on a zero markup basis to re-purpose and sell to clients. TripWing: An itinerary builder that allows advisors to easily generate professional materials including itineraries with just a click of a button, keeping clients updated. Yonderbound: The world's first travel knowledge monetization platform, where verified professional users create stories featuring hotels and activities that anyone can book, promoting advisor trips and contact information. Through its Incubator program, Virtuoso is leading the charge in improving the customer experience by attracting technology solutions to the travel industry. Participating companies benefit from the participation and guidance of the group's advisor-based Technology Committee, which tests the product, provides real-world feedback and allows the company to continue iterating its product to better meet the needs of travel agencies, advisors and clients. Three participants from the 2015 program have become full Virtuoso partners: itinerary management solutions Umapped, TripScope and Axus. "The Virtuoso Incubator program is key to keeping our business cutting edge," said Amanda Klimak, a participant in the Virtuoso Technology Committee and president of Largay Travel in Waterbury, Connecticut. "With Virtuoso doing the initial vetting and collaborative testing, we, as members, have a much higher degree of confidence that we can enhance the way we serve our clients, apply efficiencies or actually see more value per transaction through these tech initiatives." Virtuoso Incubator is accepting applications for the 2017 program, or as additions to the 2016 program if an immediate need arises. Interested companies can contact the program at incubator@virtuoso.com. For additional information, please visit virtuoso.com/incubator. 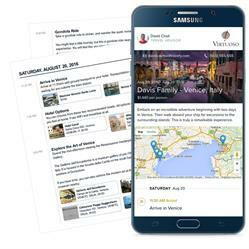 Travefy's tool, customized for Virtuoso travel advisors, offers a way for travelers in a group to review and discuss itineraries with their advisor and each other. Engage offers integrated chat and video communication options that link travelers directly to their Virtuoso advisor with a single click.